The next time someone smirks at your portfolio of gaming stocks show them these statistics: In the last one year, stock price grew 42% for Activision Blizzard (ATVI) and Electronic Arts (EA), 76% for Take-Two Interactive and 50% for Sony Corp (SNE). Also, the ETFMG Video Game Tech ETF grew over 60% in 2017, eclipsing 28% recorded by the Nasdaq composite index. Oh yeah, and don’t forget to return the smirk. Gaming stocks have been some of the best performing technology stocks over the past few years. According to research firm Newzoo, the industry is predicted to grow more than 8% this year. Meanwhile, the future is not so bright for game retailers such as GameStop (GME), Best Buy (BBY) and Target (TGT) — given the shift from over-the-counter sales to the digital download of titles. Microsoft (MSFT), for instance, is building a “Netflix of games” from where gamers can download titles and play on any connected device from any part of the planet. Digital downloads will ease pressure on the margins of game developers, but the lack of middlemen in this system will hit retailers big time. Industry experts expect even Amazon (AMZN) to take a hit as online sales of physical titles will also dwindle; paving the way to direct digital downloads. Finding out the best stocks in the gaming industry is a no-brainer. Official licensing from FIFA to replicate its tournaments alone makes Electronic Arts an irresistible stock. It also has a promising line-up including Battlefield, Anthem and Need for Speed. 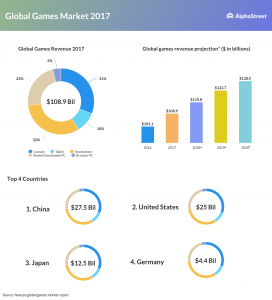 Activision Blizzard has effortlessly cashed in on consumer spending for in-game purchases, helping it report double-digit revenue growth per user last year. The Overwatch developer also has the brain behind Candy Crush Saga, King Digital, in its kitty. Though Activision faced some flak for paying as much as $5.9 billion to acquire King Digital in 2016, the new unit has been a driving force for the company’s revenue and earnings since then. While Grand Theft Auto is expected to drive sales for Take-Two, Sony will probably see a surge as it converts its PS4 into a connected home device. Alternatively, if you are looking for a cheaper stock, you may consider Glu Mobile (GLUU), which is currently valued below $4. Glue is the maker of addictive games such as MLB Tap Sports Baseball, Racing Rivals as well as Kim Kardashian: Hollywood. 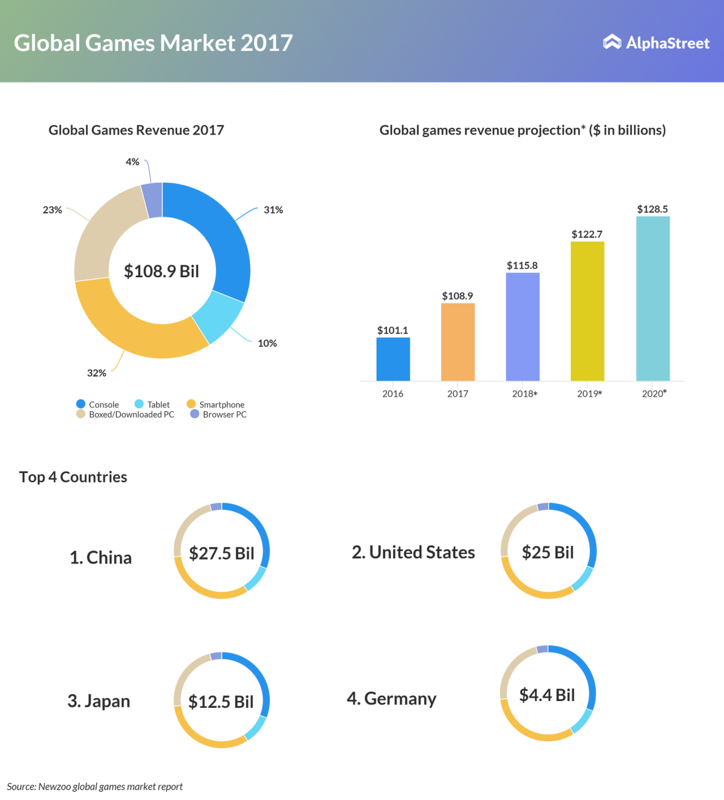 The company has so far been successful in projecting itself as a leading gaming platform, and the likelihood of a takeover is also pretty high.